It’s time to start thinking about gardening! This year, I’m planning on creating my best garden yet, and I’m going to use a vegetable garden planner to do it. The Ultimate Vegetable Garden Planner is what I recommend for planning your herb and vegetable garden this year, next year, and for years to come! The planner comes from the brilliant mind of Julia, author, homesteader, and founder of Reform Stead. And guess what- it’s half off right now! On top of that, the author is very kindly offering an extra 10% off for my readers- just use code SAVE10% here! Reform Stead is a hub for all things homesteading and natural living/farming/gardening. It has a ton of information for anyone hoping to live holistically and in a way that’s healthy for the land and your family! I’m excited to tell you about an awesome planner (that’s more like an entire garden planning program) because I know it’ll be a huge help to your gardening. This website contains affiliate links- meaning that if you follow a link to something I recommend, I might receive a small commission at no extra cost to you. I only recommend products I love! More info here. Full disclosure- I received this planner in exchange for my honest review. All opinions are my own. You might be one of those people who can store endless information in their head. I’m not that way. I’m terrible at planning ahead and remembering deadlines and things, so what usually happens is this: close to spring, I think, “oh yeah, I should think about gardening!” Once I finally get around to it, I find out that I should have planted seeds weeks earlier than I did, and I’m stuck either buying more expensive plants from the local nursery, or tending to a garden that’s weeks behind (which is sad since our growing season isn’t very long to begin with). I also usually scribble down notes on when my seedlings should go outside, how often they need to be watered, and everything like that, but I inevitably misplace some of the information. Every time. I’m not sure how that happens! But all of that changes when you use a quality vegetable garden planner tool to keep everything in one place and walk you through all the steps. One of the biggest beneficial side effects of using a garden planner is that it gets you outside more! You’re more likely to spend time in your garden if you have it planned out and have a direction for your gardening goals. Getting outside and grounding is a huge part of a healthy lifestyle, and an important healthy habit to create! How can a garden planner help you? Other than that fantastic side benefit, there are a couple more big ways a good garden planner can really help you and improve your garden this year. A vegetable garden planner helps to ensure that you use your growing time to its fullest potential, and you won’t forget or repeat tasks when you keep track of them. You’ll save time by planning out your weeks and tracking what needs to be done. You’ll save space by planning out where to plant things in your garden before you even start your seedlings. You can also track your seeds and when they need to be planted, which means you won’t need to do last-minute shopping to buy plants from the nursery. This will save you money! You can also track your budget, expenses, and estimated income to make sure you don’t get carried away with your spending. Overall, a good garden planner can help you save time, space, and money! But you can’t just use any old planner- you can read below about why the free garden planners you find online usually aren’t the best option. Instead, I use the Ultimate Vegetable Garden Planner. Read on to find out why I love this planner, and where you can get yours! This is the master planner you never knew you needed. Well, I knew I needed to plan out my garden better, but this is everything I wanted for that… along with so much more! You can find more about what’s included in the planner below. It’s also just a really pretty garden planner. If you enjoy bullet journaling or just having things look nice and be in order, you’ll love this planner! It would have been easy to just copy and paste things like the weekly calendars, but Julia went the extra step to give each week a different color and look. The whole planner has a lovely appearance! Finally, I love how this is a one-time purchase. You can reprint pages and use your vegetable garden planner year after year, tweaking the pages you print to fit what you need! I’m excited about being able to look back at the goals I write in here each year. What’s in the Ultimate Vegetable Garden Planner? This garden planner includes over 200 pages to help you plan, track, and set goals for your garden this year. 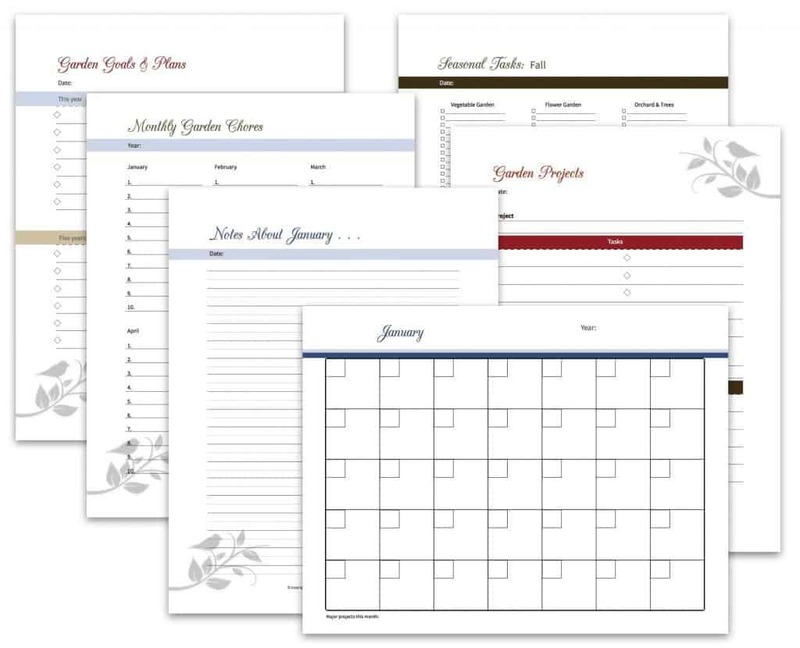 There are pages for notes, weekly and monthly calendars, garden planner templates, places to record your harvests and goals, and much more! There’s even a place to track how you’ve amended your soil over time. Super helpful! I add things to my soil but have never tracked it before. This should help me to remember what I’ve done, and work to improve my soil as much as possible! And the numerous pages of graph paper are perfect for planning your garden layout, no matter what size. These pages would work great for a square foot gardening template! There are multiple graphs for each type of garden, including an herb garden and orchard. From beginning to plan how to use your space and time, to finally harvesting and taking a look back at your goals, expenses, and income, this garden planner has you covered! You don’t need to use every single one of these pages, though- just print out what you need! And if you want any extra pages, you can print out more whenever you need them. The garden planner download is yours for life. 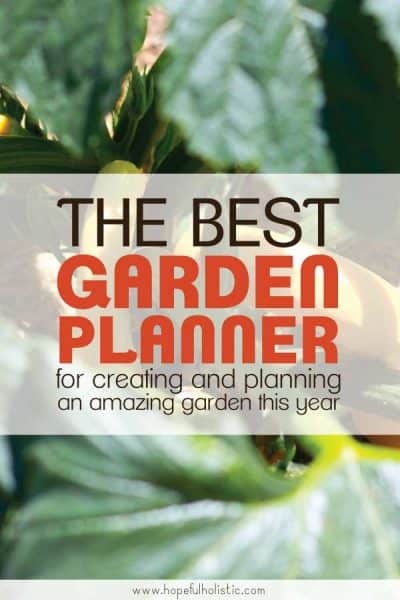 You won’t need to buy a garden planner ever again! One of my favorite parts of my garden planner is the companion planting guide. It is so helpful to have everything I need for companion planting in one place! Last year, I wanted to try companion planting in my garden and I ended up Googling, “can I plant _____ next to _____?” over and over again, for almost everything, because I couldn’t find a good resource that included everything I wanted to plant on one site. But with this simple guide, it just takes a glance to see if two plants will benefit from being planted next to each other! I’m planning on using this to help me create the best vegetable garden layout possible. There are also some bonus bullet journal pages included at the end of the planner. You can print out as many as you need as use them to creatively plan your garden, bullet journal style! 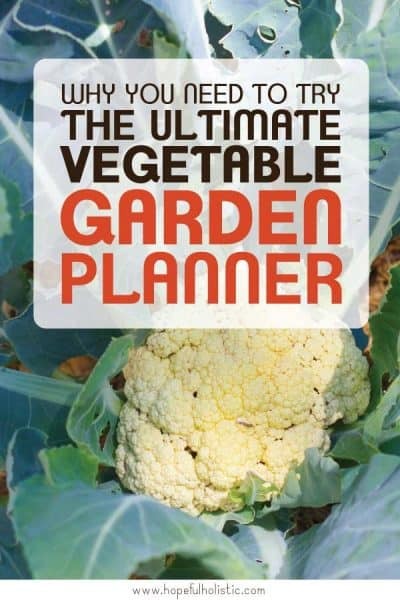 The Ultimate Vegetable Garden Planner is also way better than the free garden planners you can find online, in my opinion. You can search for “free garden layout planner” online and come up with a bunch of options… But most of them are just plain graphs that you could easily make yourself. A few years ago, I downloaded a free online virtual garden planner. It was clunky and didn’t really give me anything I couldn’t have made myself. The space requirements of everything I wanted to plant were approximations, which didn’t help me plan out the space in my garden very well. It ended up looking way different from what I had in the online planner! Many of those free planners are trial versions that happen to come with numerous upgrades that you pay for, which kind of defeats the purpose, right? With this planner, you pay once for everything you need. You’ll receive a PDF of over 200 pages, which you can tweak and reprint as much as you want! For example, I’m not going to use the weekly and daily garden chore list that much, since my garden is pretty small and I don’t need to plan out a ton of chores in advance. So I’m probably not going to print out many of those pages. But the seed and transplant planner is something I’d use a ton, so I can just fill up those pages and then print out more as needed! It’s super easy to personalize and only print the sections that you’ll need so that you don’t waste paper or ink. 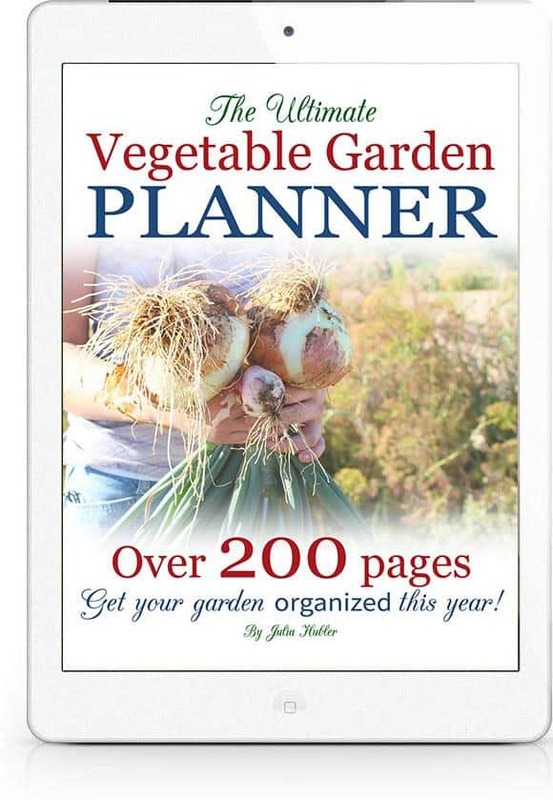 You can buy The Ultimate Vegetable Garden Planner here from Reform Stead. It’s currently a ginormous half off right now, and you can get an additional 10% off on top of that! Just use code SAVE10% here. When you order the Ultimate Vegetable Garden Planner, you’ll get a PDF download that’s yours to keep! You can download the garden planner printables and print out more pages any time you need it. So while you’re only buying one planner, it’s actually like you’re buying a planner for years to come! Use this planner each year to track your goals and look back to see how you’ve grown over time. You can also easily look back at your garden layouts of the past. Make notes about what’s worked best, and create the best vegetable garden layout possible! There’s no limit to how great your garden can be with this planner. Buy one and see for yourself! Make sure to buy a good binder to store your planner- I’d recommend a half inch binder. There are printables included that you can put in the spine and front of your binder. Want to remember this for next year? Pin it for later! If you have any questions about what’s included in the garden planner, let me know in the comments below! Like it? Check out these similar posts!